We’ve talked about eating fresh produce that is in season for your area before. Ever on the lookout for new ways to do this, the Victor crew found that the site we’ve written about before, Seasonal Food Guide, has revamped their site a little bit. They have added location detection to your find where you are. What is also nice is they also have an app. How many times have you bought something only to find its quality isn’t what you were expecting or it didn’t last as long as you thought it should? Don’t waste time or money on things not grown locally. 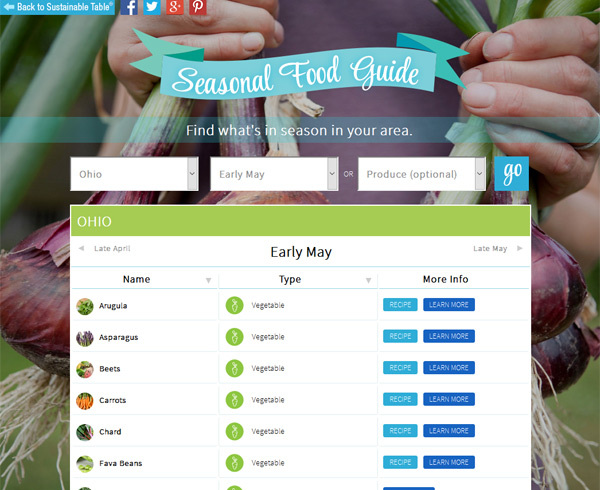 Think of Seasonal Food Guide as your digital almanac. When you buy items in season, you are more apt to get them shortly after they are harvested. In season, produce is fresher, tastier, and has more nutrients than food that may have been sitting warehoused somewhere. If you are lucky to have a Wegmans near you, you may even find a few displays that tell you which local farms the items are from. You can also look at your local farmers’ markets to find locally harvested food. By buying local, you also support your local economy. Want recipes for real food? Check out real food right now. Now that summer is almost here, the Victor crew thought it a good idea to revisit the Dirty Dozen guide for this year. Strawberries are high on the list because of the dozens of pesticides used with some of them including chemicals linked to cancer and reproductive damage. Poisonous gases are also being used in the soil, including nerve gas. Spinach has moved to second place because of a pesticide banned in Europe. Some sweet corn, papayas, and summer squash are made from GMOs in the U.S. The Victor crew wanted to find out more about peas. Sometimes these vegetables are considered a starch. We were curious why. One cup of peas is 118 calories. They contain 7 grams of fiber and 8 grams sugar with total carbohydrate of 21 grams. They also have 8 grams protein. A peas is actually a seed and botanically it is a fruit. Split peas are peas that are peeled and dried. Peas are generally boiled or steamed. If you use frozen peas, you can add them to salads if you just thaw them out. They do not need further cooking. Small peas are younger, sweeter, and more tender. If you have fresh peas, use them right away or freeze them as they do not last much longer than a couple days. You can also use them raw in salads. The main types we see are snow peas, (sugar) snap peas, and garden peas. Snow peas are used much in Chinese cooking and stir-fry well. The strings along the edges are usually removed before using. The entire pod is eaten. Garden peas grow several in a pod and these firm pods are rmoved before eating. The pods are usually discarded but you can use them to make stock. If they get too large or old, they get mealy. Snap peas are kind of a cross between garden peas and snow peas. The whole pod is eaten and they may be eaten raw or cooked. They have strings at the seams that also need to be removed just like the snow peas. A popular pea salad in the south is to mix peas, hard boiled eggs, and mayonnaise. You can add onions, bacon bits, pimientos, or whatever else you want along with seasonings. The Victor crew found a great website if you are looking to eat fresh. You can put in your state and time of year and get a list of what produce in general is in season at that time in your area. Not only will it show the list of produce that are in season, but a link to a recipe for that item. They also have a “Learn More” link you can click to see its history, some facts, cultivation information, the environmental impact, what to look for when buying, nutrition, how to store, how to cook, and another recipe. On the bottom you can also click on the link to find Farmer’s Markets in your state. Fruits and vegetables always taste and look better when you can buy them locally. But how can you tell what is in season? Does it matter where you live? The Victor crew set out to find where we can get this information. We found some interesting sites with just this information. On this page, there is an alphabetical list of fruits and vegetables with the season they can be found. They also have separate links to see lists by season or region. If you click on a vegetable, asparagus for example, it takes us to a page with a list of articles about asparagus, how to cook it, how to trim it, and some recipes. This site will give a seasonal food of the week along with a list of what is in season now. The Unites States Department of Agriculture should know! Here you find a list broken down by season. When you click on a food, you get a page with Fact Sheets, recipe sheets, how to cook them from different states and Universities. This should get you started to eat more local produce.